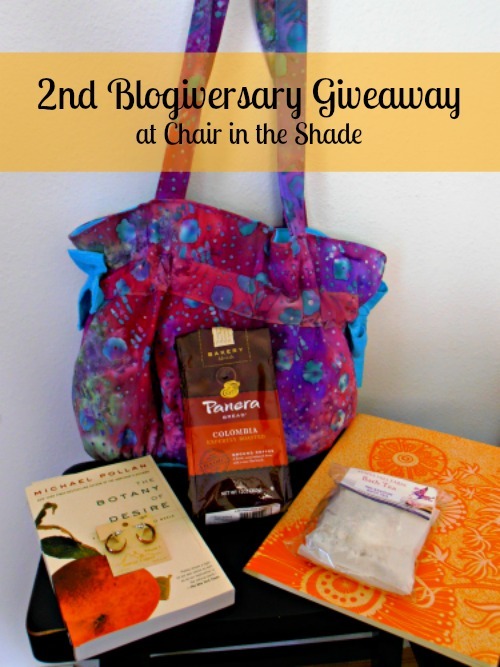 Chair in the Shade: Chair in the Shade is Turning Two! Can you believe it? June 26 will mark Chair in the Shade's second birthday! Time really does fly. I've changed directions, and learned so much since I started. I've met so many interesting people and really love the community blogging provides. I've really been working on simplifying my life in all areas as of late- whether it be what I eat, how much stuff I have, or what I buy. So I decided to do a giveaway full of some simple pleasures and what is more simple than good coffee, a great book, or a relaxing bath? To see more about all the prizes, please read on. So much in the way that I filled a bag with a bunch of favorite things last year for my Blogiversary giveaway, I thought I'd do the same this year. A bag made by yours truly in a funky pink and turquoise batik with turquoise lining and accents. Great for lugging things to the beach, hauling books to the library or filling with snacks for a road trip. A bag of Panera Bread's Columbia coffee- my current coffee of choice. A brand new copy of Michael Pollan's The Botany of Desire. It's not a diet book, there are n recipes, but it will really change your thoughts about food. A pair of copper hoop earrings from Copper Harbor, Michigan. These little cuties are engraved with flowers. I have a similar pair, and they're my most favorite earrings. They go with everything. You can dress them up or down. And they're unique. A large Moleskine notebook. Perfect for journaling, making lists, or plotting what to do with your life. Prize value is approximately $50. Unfortunately, due to the weight of the prizes, contest is only open in the US. But don't worry! There will be future contests open to all. Just enter using the Rafflecopter widget below and be sure you leave an email address where I can reach you if you are a no reply blogger. Giveaway runs from today through my blogiversary. 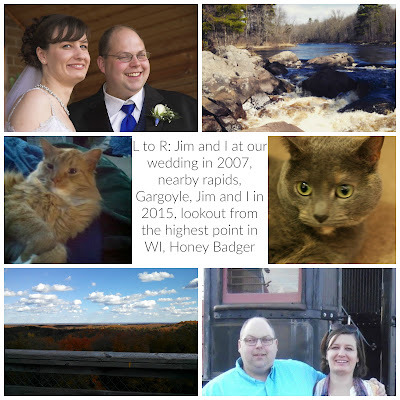 Thanks for celebrating my Blogiversary with me and good luck! Congratulations on year #2. I wish you the best for Year #3. Congrats. Love your blog and so glad to see some of your favorites. Congratulations on your year 2! Wishing you many more. My favorite way to unwind is to read. Congrats to you! I unwind by reading, gardening and sewing and of course, reading blogs! I unwind by reading a good book or knitting! I love to unwind by reading or sewing. Congratulation on your blogiversary! I unwind by crafting. I sew, crochet, quilt and cross stitch, so it really depends on what I am working on this week. Congrats on your blogversary. I like to unwind working in the garden. Thanks for sharing your anniversary with us! My favorite way to unwind is to play Words With Friends...I usually have 3 or 4 games going and am pretty good too! Happy anniversary and thanks for the chance of winning those great prizes! Happy 2nd Anniversary! I have loved watching your changes and I agree, it is such a wonderful community. Happy 2nd anniversary!! Here's to many many more Happy Year's too! Coffee is on the top of my list of unwind activities. We have a great Coffee Shop in our town and I always feel relaxed when we go for a visit. I hope you have a wonderful day. I like sitting out on my deck and watching the sunset, with a glass of wine. Congratulations! I sew,garden or read depending on the season and weather but mostly I sit in the rocking chair on my front porch and watch the hummingbirds at the feeder. It's a nice quiet way to spend some time. I love rewinding with a good book or sewing!! I unwind sitting outside on my deck with a good book and a glass of wine.